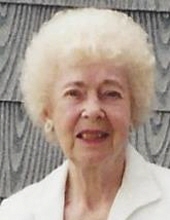 Frances "Fran" Deasy age 92 of Hammond, passed away Friday, March 22, 2019. Fran is survived by her son James Deasy and daughter-in-law Nancy Deasy of Bellingham, many nieces and nephews who will miss their Aunt Francie. Fran was born in Hammond to Justine and George Lee, the youngest of three sisters. She graduated from Hammond Technical High School and worked in retail sales. Fran married the love of her life, John "Jack" Deasy in 1949 and was happily married for 66 years, until his death in 2016. She was known by friends and family as a talented cook, whose desserts were always extra special. Fran was a devoted mother and homemaker who enjoyed dancing and gardening. She volunteered in the community, delivering meals on wheels to the homebound. The light in this world is dimmed by her passing, but she is surely together again with her beloved in heaven. To send flowers or a remembrance gift to the family of Frances L. Deasy, please visit our Tribute Store. "Email Address" would like to share the life celebration of Frances L. Deasy. Click on the "link" to go to share a favorite memory or leave a condolence message for the family.